Everyone wants to get great deals on everything they purchase, including furniture and home décor items, and you will find many people shopping at discount furniture stores to get the best prices. While it is possible to get low prices on furniture at these stores, it is not the best way to get high quality furniture that is going to be durable and last for many years. 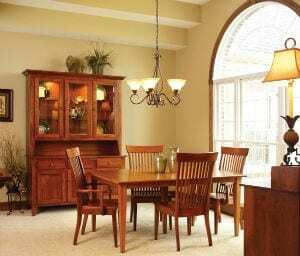 The furniture available at these stores can’t possibly hold a candle to the high quality Amish Shaker furniture you will find at Amish Originals Furniture Co. in Westerville, Ohio. These items are all lovingly crafted by hand and made to order. This means that you will be getting exactly what you want, at a price you can afford, and the furniture you purchase will be made from the highest quality of materials, including American hardwoods. The Amish settled in the United States, mainly in Pennsylvania and parts of the Midwest, in the 1800s, and established a reputation of being incredibly hard workers who took pride in every item they created. It was around the 1920s when the popularity of Amish Shaker furniture really started to take off, and people started to really notice the detail and beauty of the pieces made by these hardworking people. There are various “schools” of Amish furniture making: the Jonestown School, which is known for painted blanket chests that can be found in the Smithsonian and at the Metropolitan Museum of Art; the Soap Hollow School, which is famous for pieces that are painted in bright colors, usually reds, gold and black; and Henry Lapp is responsible for creating the designs that we recognize today as coming from the Amish. You will find items made by the Amish in many homes across the United States, as well as all over the world, because everyone knows about the quality of these handcrafted pieces. One of the amazing things about Amish Shaker furniture is that is made without the use of any electricity at all. Most of the tools are run by hydraulic and pneumatic power used for diesel generators. These days, many Amish communities do allow the use of some electricity, although most Amish people will say that they are much more proud of the work that is completely done by their own hands and the sweat of their brows. You can get all kinds of deals at discount furniture stores and department stores, but if you want to have the quality that can only be found in Amish Shaker furniture, and you live in Central Ohio, you need to see what is available from Amish Originals Furniture Co. Even if you live far away, you can still browse our items online at amishoriginals.com, and contact us to have them shipped to you, anywhere in the continental United States and around the world. Drop into the show room today, or go online to see all of the amazing pieces of Amish Shaker furniture available to you. Choose your styles, type of hardwoods and finishes, and have furniture that is handcrafted by the Amish and built to last.